In a nutshell: Length: 40mtr, 63ft of #16 vinyl insulated wire. 20mtr, 33ft. of vinyl insulated wire. Feedline, 25ft of RG174. Tie off line for the elements, 1/8 inch shock cord with cord locks. 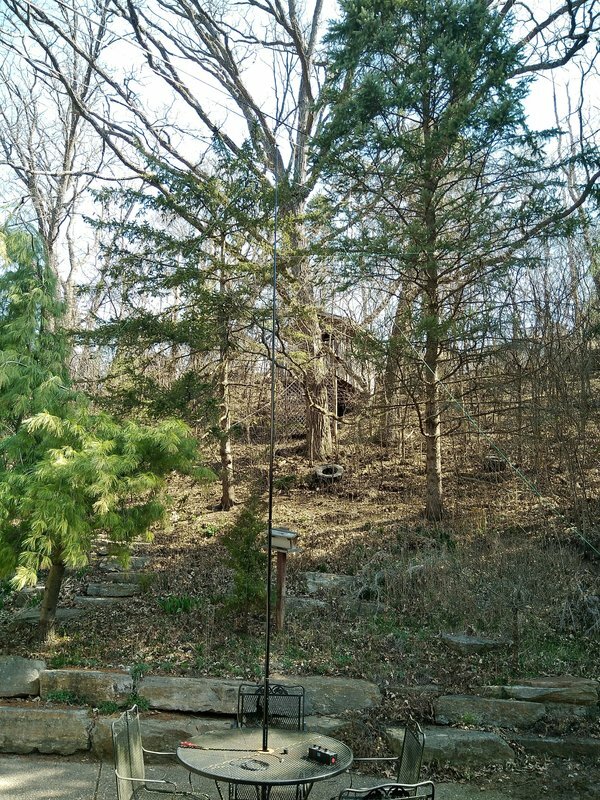 Mast, about 17 feet, the Shakespeare TSP20 Six-Piece Wonderpole minus the top 3-1/2 ft section. My makeshift operating setup on the left. Everything all packed up to go inside on the right. 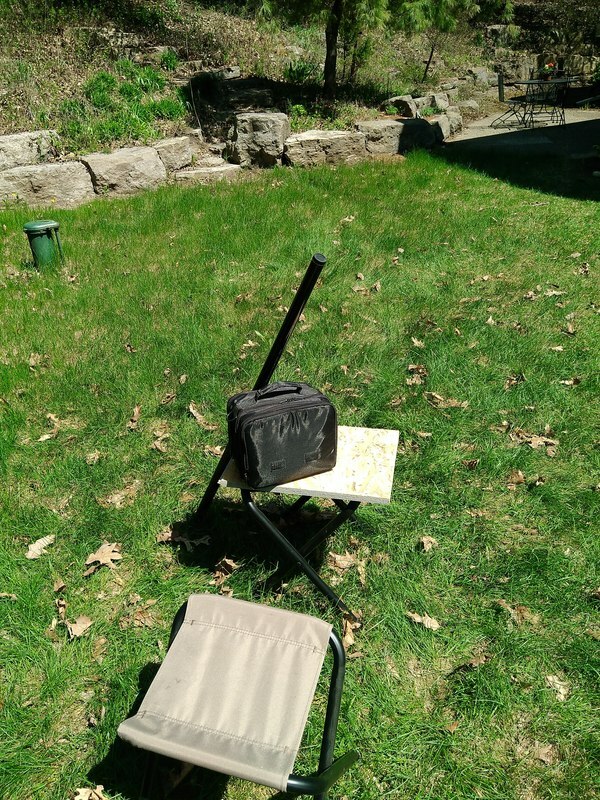 2018-05-06 At 1:00 this afternoon I headed outside with my antenna pole and bag of gear and set up the antenna and station in the middle of my back yard again. 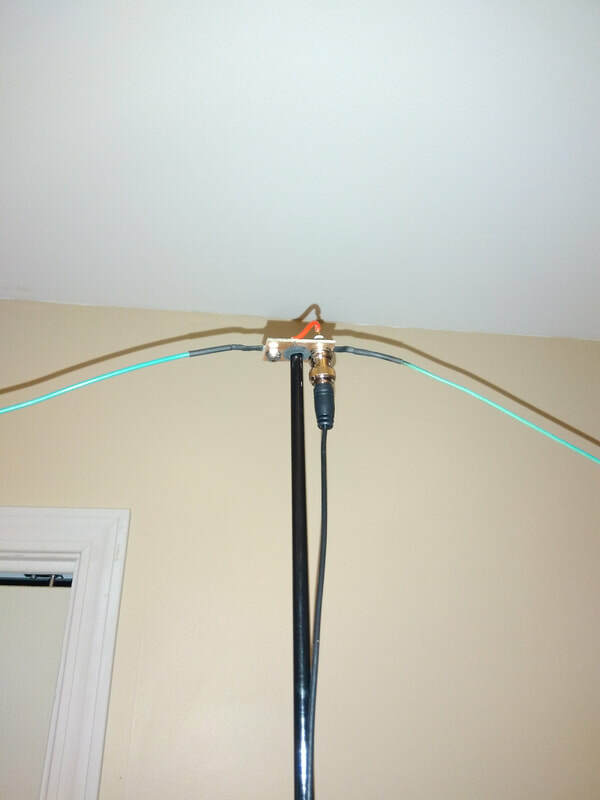 This time I kept the ends of the antenna elements a little higher off the ground by using longer shock cord. 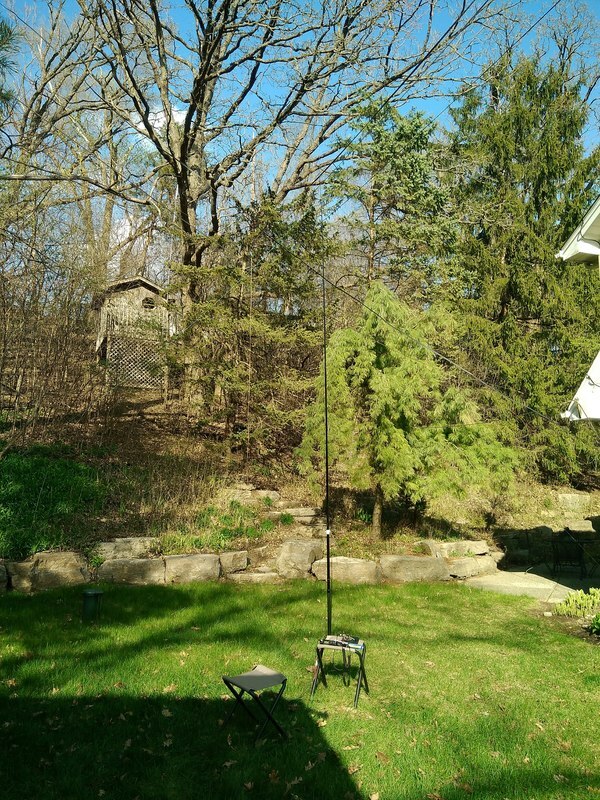 SWR was very good on almost all of 20 meters and acceptable on the lower 2/3 of 40 meters. I tried 40 but there were almost no signals and those I did hear were very weak. I tried calling CQ anyway, but no joy. But there was a contest on 20 so I made two contacts with stations in Massachusetts on 20. This time I did all CW. 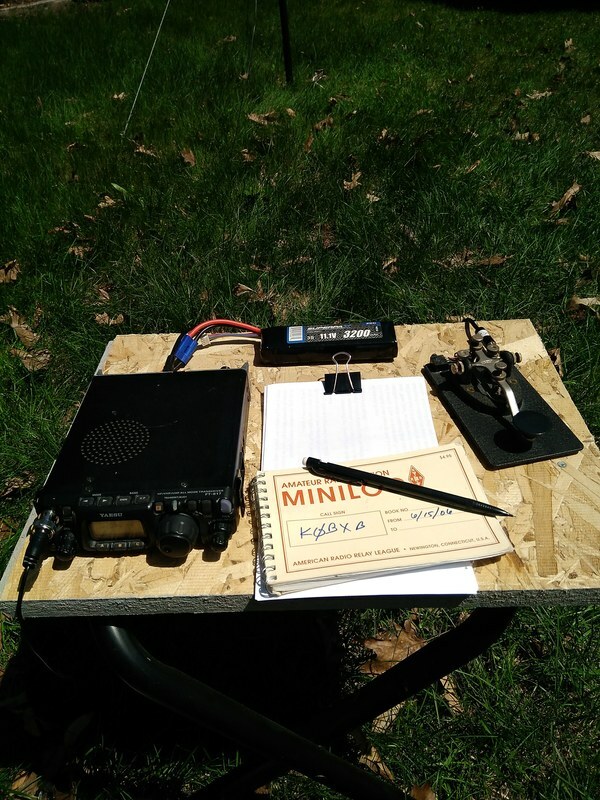 Both stations gave me good signal reports. All traces were gone and I was inside by 2:20pm. I still need to set it up a few more times to kind of get in mind the most efficient way to go about it so wires don't get tangled, etc. One thing I have done is remove the top segment of the pole. It's too flimsy to use and it just complicates setting up. I love not having to fool with a tuner, just connect and go! I think this is a keeper. 2018-05-05 Today is an absolutely beautiful day. Clear sunny skies. Temperature in the 80's. Light breeze. So I packed up my antenna and radio and my Electric Apprentice RC plane and headed out to our Silver Eagles RC Flying Club field to help with clean up for the new flying season. But I got distracted after helping cut the grass and set up my radio and antenna rather than fly my plane! 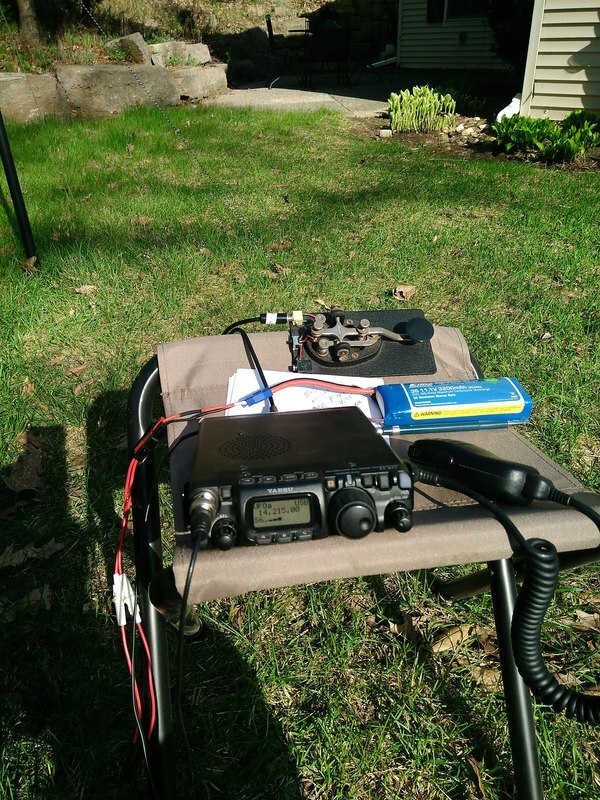 It was fun to make two contacts on 40 meters, proving that it works on both 20 and 40. I think it is ready to be used "in the wild." 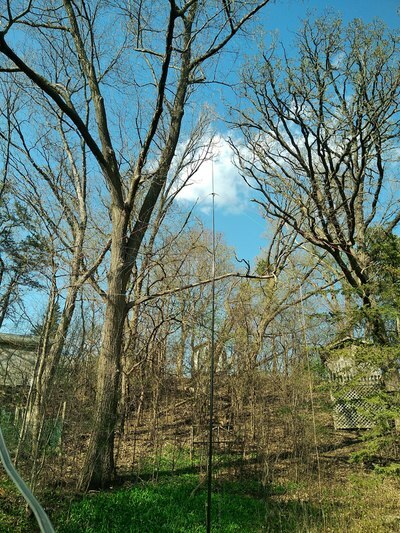 2018-05-04 I didn't have time to play with my antenna at all yesterday other than to make a sleeve to slide over the next to lowest segment of my 20 ft Shakespeare TSP20 Six-Piece Wonderpole mast for attaching guy lines to hold it upright. 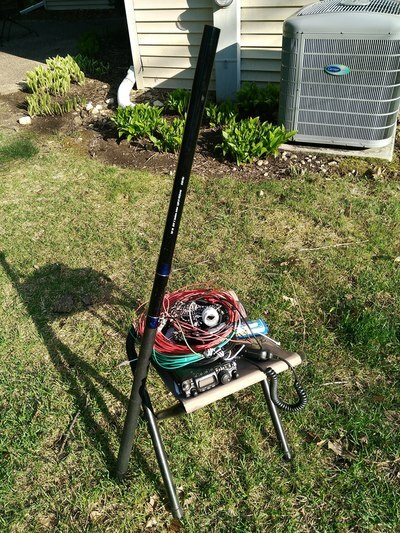 This afternoon about 3:30pm local time I decided to set it up in the middle of the yard, more or less as I would in a real portable situation using the pole, my fabricated guy lines, 40/20 Inverted Vee and my Yaesu FT-817nd, mic, key and a 3200mAh Lipo RC plane battery. The five foot guy lines and pole went together nicely and I anchored them with 8 inch tent pegs. 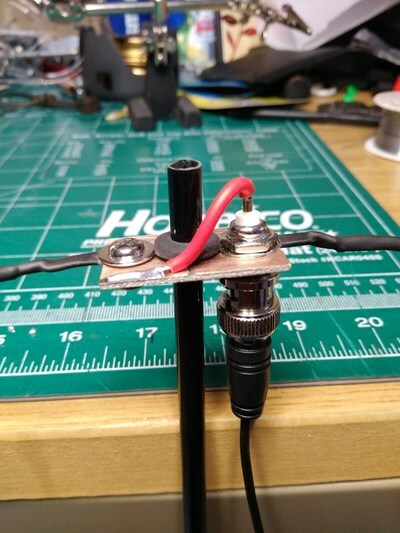 I had been thinking about how best to tie off the ends of the antenna elements and decided to try shock cord (about 1/8th inch bungie cord) and cord locks that I use with my camping stuff. 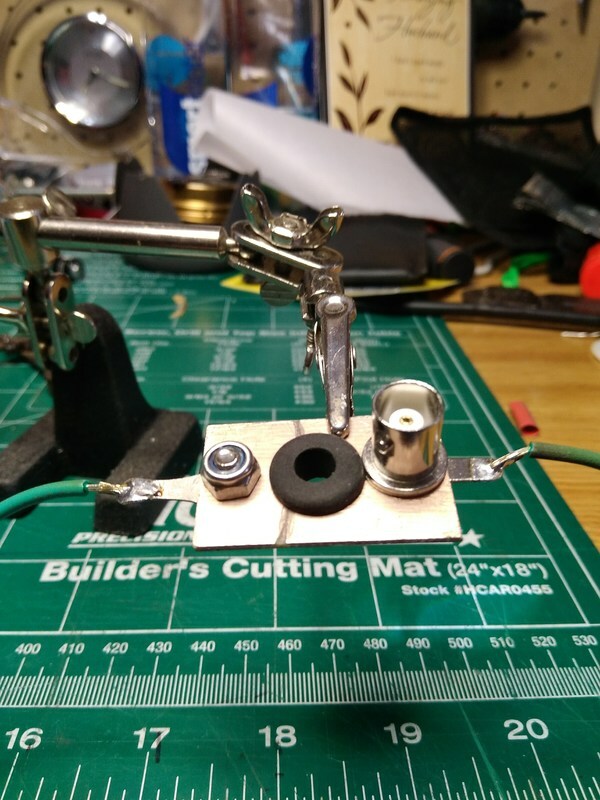 It worked very well, allowing me to lightly stretch the wire but keep everything flexible. I secured those with tent pegs also. I don't know how all that would perform in a windy or gusty situation but in my pretty calm back yard it worked very well. A couple camp seats provided a place to sit and a "bench" for the rig. After connecting everything up I did a quick SWR check on both 40 and 20 and it was very low! No adjustments needed from the way I set it two days ago. So I tuned up to the SSB segment of the 20 meter band and immediately heard K7PE, Bob 1,424 miles away in Idaho calling CQ on 14.215. He was S8 so I gave him a call. To my shock, he came back. I had to repeat a few times during our six minute QSO but he heard my 5 watt signal, copied everything and asked about my setup. We even chatted briefly about the new YAESU FT-818 that was just released and its pros and cons. The photo shows the collar I fabricated from PVC pipe fittings for attaching the guy lines to the pole. I started with a sleeve intended to join two sections of PVC pipe together. It was exactly the right size to slip over the first push up section of the pole and rest solidly on the top of the bottom section. In order to have enough plastic to hold the eye screws I wanted to use for attaching the ropes, I found an adapter which fit perfectly over the outside of the sleeve. Using a hack saw I cut off the thread end and sanded it all nice and smooth. Then I pre-drilled holes for the three eye screws. I had to remove the screws and cut off their ends so the points wouldn't scratch the fiberglass pole. I've only used it this once but I think it will be OK. I cut the ropes five feet long which places the tent peg about three feet out from the pole. They may be a bit too short but for this first run they worked very well and the pole was very stable. Collar for attaching guy lines to the pole made from hand selected PVC fittings. The pictures above: Top left, the top of my pole showing the center insulator. Top Center, my station right after the QSO with K7PE. Top Right, the entire pole, guys, etc. 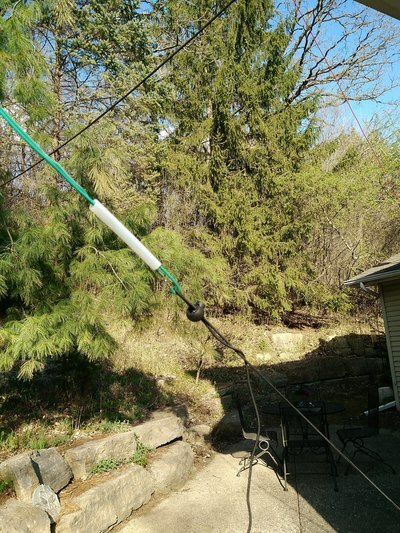 Bottom left, shock cord attached to the 20 meter element. Bottom Center, the other end of the shock cord on a tent stake. Bottom right, the station completely disassembled and ready to take inside. It took 20 minutes to go from the working setup to this point. Now I have to figure out how to pack it to make it easy to transport! 2018-05-02 Today I "tuned" my dual band fan inverted vee. The center frequency of the 40 meter one is about 7.1mhz. The center frequency of the 20 meter one is about 14.1mhz. In the process I learned that the length of the fold-back section at the end makes quite a difference once it reaches about a foot or more. The finished length of each 20 meter element is 16' 6" with 14 " folded back on itself at the end. The finished length of each 40 meter element is 31' 6" with 10" folded back. End of the elements (red = 40mtrs, green = 20mtrs). 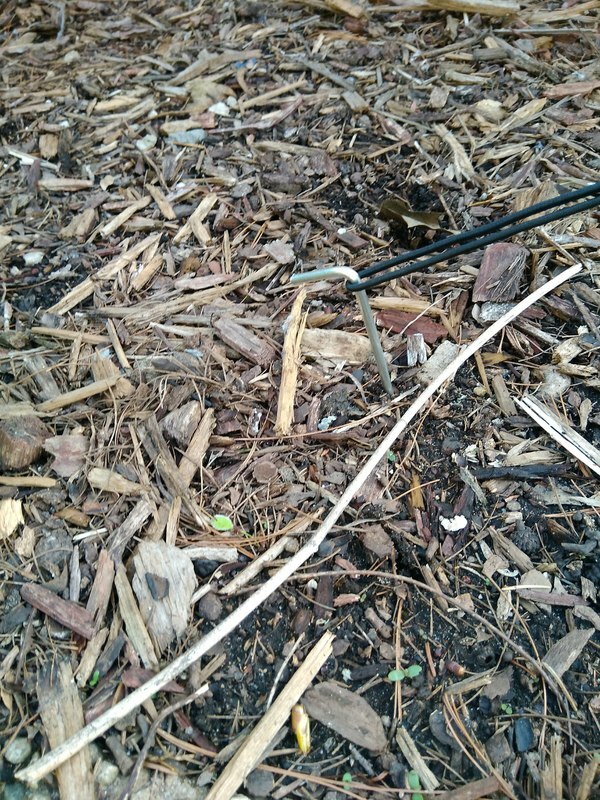 The piece of tubing keeps the wire bent back on itself and the wire tie keeps the tail from sagging down. 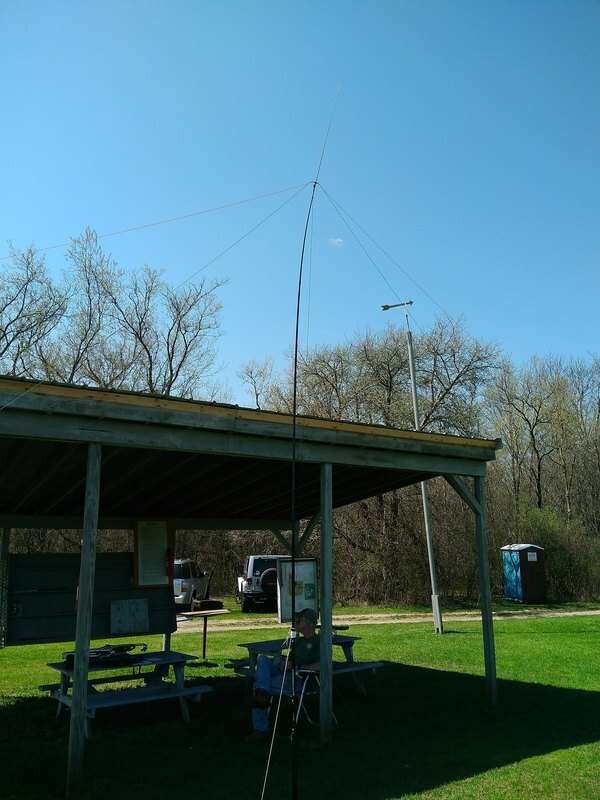 I ran out of time so didn't try any contacts but even though the bands weren't very good or busy mid day, I heard a number of strong signals on both bands. The SWR on my Yaesu FT-817nd was very low on both bands. 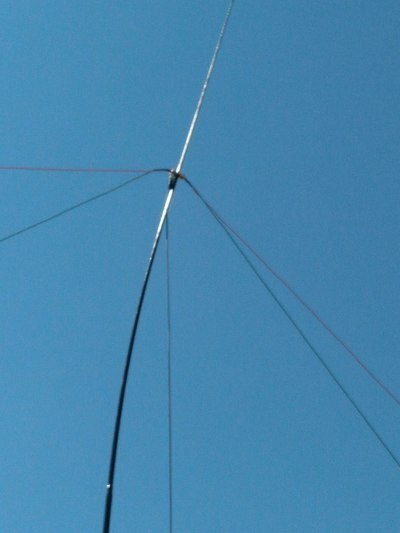 It crept up some on 40 meters near the top of the band. So far, so good! 2018-05-01 I cut the two 33 ft lengths for the 40 meter elements and soldered them on. When I set it up to check it out I was surprised. 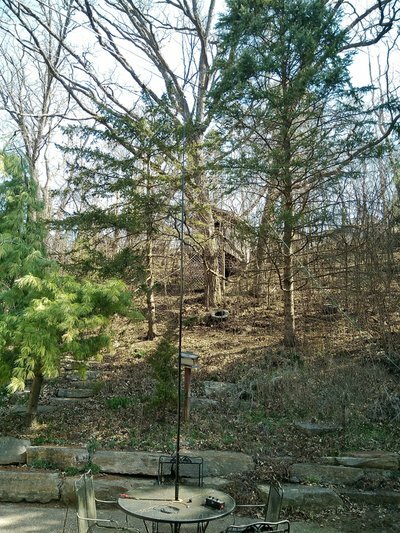 The resonant frequency of both the 20 meter and 40 meter ones was way high. 14.2 or so and 7.4mhz. Alone, the 20 meter one had been about 14.02. I lengthened each one as much as I could but still was way high as I'm aiming for the CW portion of both bands. I've added twelve inches to the 20 meter one and 24 inches to the 40 meter one. It was too late to check it out so will play with it again tomorrow to see if I can get both where I want them. 2018-05-01 I took the pole and antenna outside today. The pole fit nicely into the umbrella hole on our patio table so was easy to erect! After attaching the center insulator/connector, pushing out the pole and staking out the 20 meter elements I folded the ends of the elements back over each other until the resonant frequency was 14.1 or so. My Yaesu FT-817nd liked what it saw and seemed to both hear and transmit well. The band was pretty quiet so I didn't really get to play with how well it radiates, but otherwise I'm pleased. Now to add the 33 ft 40 meter elements. 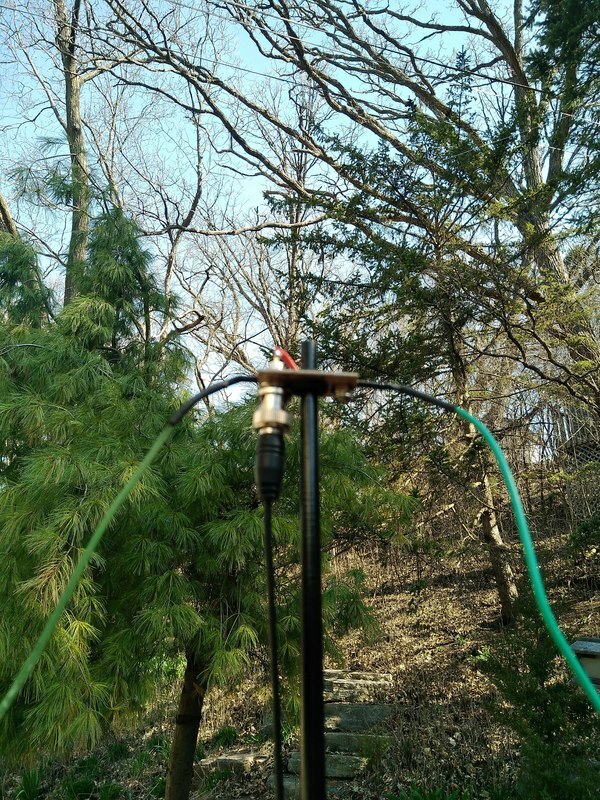 2018-04-30 What to use for antennas for field day? Options include end-fed wires, verticals, dipoles, multiband antennas like the G5RV or an off center fed Windom.... Looking at some videos the other day of guys activating summits and parks I noticed a guy was using a fiberglass fishing pole 20 feet long supporting an inverted vee. That looked interesting so I decided to give it a try. I ordered a Shakespeare TSP20 Six-Piece Wonderpole, and 25 feet of RG174 coax with BNC connectors. Next I began scratching my head regarding making a light weight 40/20 meter inverted vee that would fit onto the Wonderpole. In my junk box found a 1-1/2 x 7/8 inch piece of double-sided circuit board, a through-hole BNC connector and a rubber grommet that perfectly and snugly fit the top section of the Wonderpole. A machine screw with matching lock washer and a couple solder lugs rounded out the parts needed. After a couple hours of fiddling I had my center insulator/connector assembly fabricated. Center insulator/connector assembly for inverted vee. I used a little drill-master tool from Harbor Freight with a small grinding tool to cut the top and bottom copper plating near the center to separate to two ends for the two halves of the inverted vee. The photos show just the 16-1/2 ft untrimmed 20m elements attached. I checked it last night inside with just two sections of the pole (about seven feet). It resonated at about 13.6mhz. Hope to trim it a bit tomorrow and play with it. If all looks good I'll add the 40m elements. I used the hamuniverse Inverted Vee and Dipole Calculator to estimate the initial length of my elements.